Summary: "Lovely Sorcha is the seventh child and only daughter of Lord Colum of Sevenwaters. Bereft of a mother, she is comforted by her six brothers who love and protect her. Sorcha is the light in their lives, they are determined that she know only contentment. But Sorcha's joy is shattered when her father is bewitched by his new wife, an evil enchantress who binds her brothers with a terrible spell, a spell which only Sorcha can lift-by staying silent. If she speaks before she completes the quest set to her by the Fair Folk and their queen, the Lady of the Forest, she will lose her brothers forever. When Sorcha is kidnapped by the enemies of Sevenwaters and taken to a foreign land, she is torn between the desire to save her beloved brothers, and a love that comes only once. Sorcha despairs at ever being able to complete her task, but the magic of the Fair Folk knows no boundaries, and love is the strongest magic of them all." 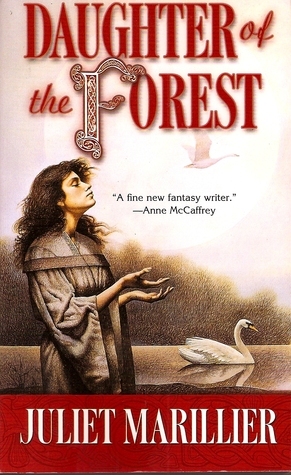 Review: Daughter of the Forest is a lovely book that I liked reading, most of the time. Sorcha is a character who is easy to root for, and the side characters all felt distinct and real. I was drawn into each of their stories as well as Sorcha's. It's a fine story, and it's clear that Marillier is a talented writer. That being said, this book is long, and it feels long. I felt like it could have been seriously pruned. I can't tell you how many times I thought, (highlight to read, don't highlight to avoid the minor spoiler:) "Oh my gosh, she still has HOW MANY shirts to make??! Maybe I've just read too much YA lately, but the pacing nearly killed me. Which would have been sad, since there is much to appreciate in this book. I'm not very familiar with Irish lore, but I loved learning about all the stories and superstitions. The world building was excellent. The forest around Sorcha's childhood home is like its own character: enchanting, inviting, and dangerous all at once. Sorcha is a willful and determined heroine, and overcomes incredible obstacles. I didn't really love her silence as a plot device, but I guess at least it's innovative. Bottom Line: This book holds a fine and unique spot in the adult fantasy cannon, and earns extra points for having a really enchanting setting. That being said, to me, the pacing was too slow. This book has been off and on my to-read list several times. I got it from the library once, but it looked so huge that I didn't read it. I've heard lots of great things though. There are so many books I want to read that look more interesting. What do you think? Should I read this? I'm not sure, to be honest. Do you like traditional fantasy novels? If so, then my guess is that you'll like it. But, to me, the pacing was just really slow. I still saw a lot of merit in the novel (especially in the world building) and can understand why so many people love it so much. I didn't love it, but I liked it well enough. I guess, if I were you, I'd give it 50 pages. That's enough for you to get a feel for what you're committing yourself to. If you're still interested, read on, though be aware that the pace never really picks up.